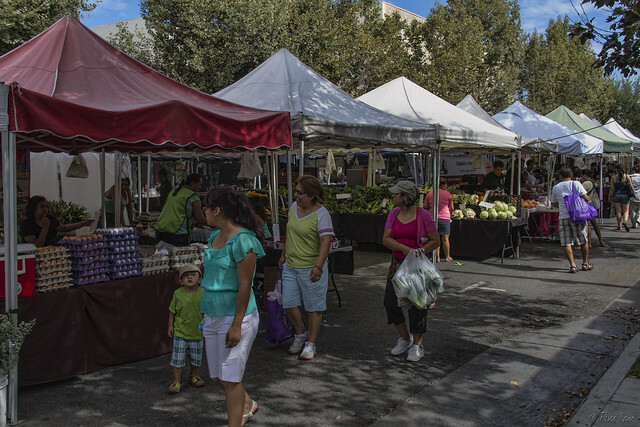 Downtown Downey was bustling with activity this Saturday morning. 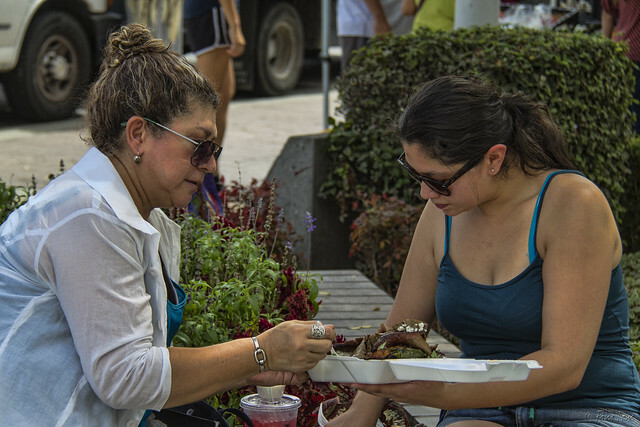 Let's start at the farmer's market. 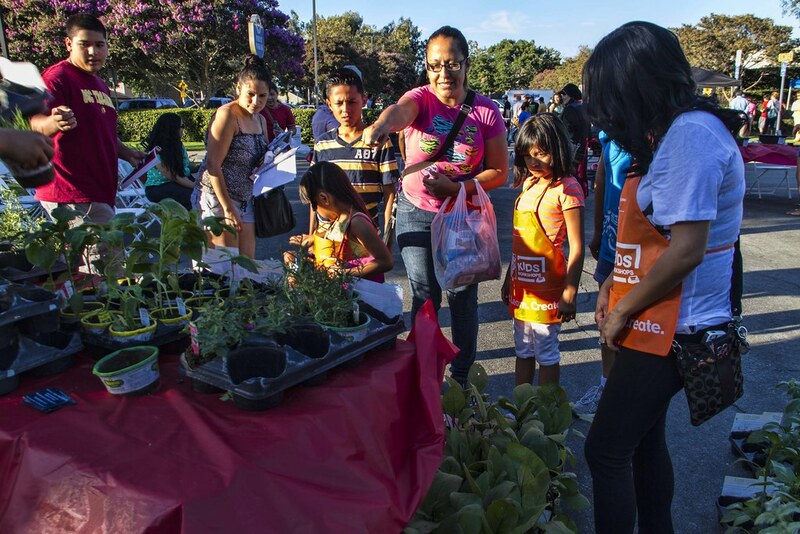 When you think about a farmer's market, you usually think about fruits and veggies and eggs. And as you can see below, there were a lot of those being sold. But on the other side of the street, there are the prepared-food vendors, where I picked up some of my favorite coffeecake from the Tropicana stall. 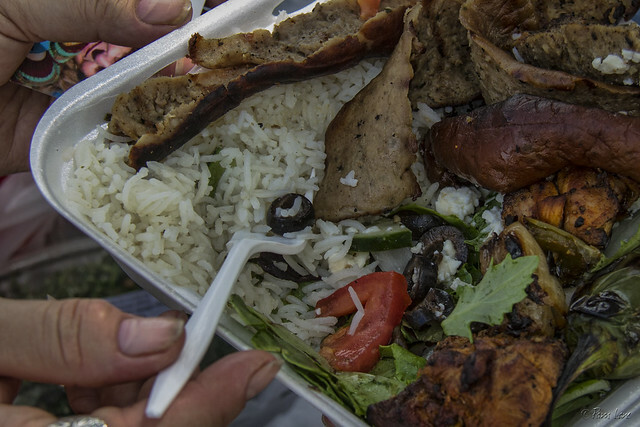 And at the end of the street, the ladies above were enjoying an early lunch from (I think) the Greek food stall. Do you ever wonder about what's beyond the gate? I so want to think there is a secret garden, or maybe a rabbit's hole to another land. I was out looking for some pictures the other day and saw these bunnies. I couldn't pull over right away because of a car behind me so I had to go around the block. When I got back on the bunny street I wasn't sure which house they were at so I parked the car and started up the sidewalk. At each house I passed I didn't find the bunnies, but I found something worth photographing. It reminded me of what my wife always says, "Every person has a story." Today I saw that, "every house has a story." So for today I'll show you the bunny house, they're hiding, and the wishing well house, notice the missing bricks. I'll save the others for another day. Have you written down your story? 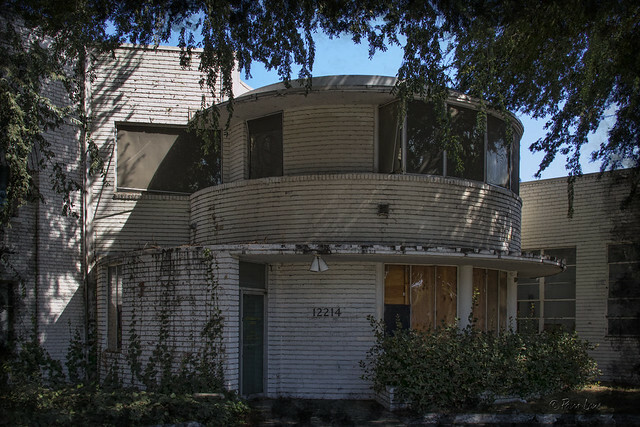 Last week we looked at several vacant buildings here in Downey. We showed how they can invite non-owners to use the property for purposes other than what the owner had intended. Today I wanted to show you that a vacant building can be changed into a beautiful place of business given the right person with a little imagination. Uyuky is just such a person. She has taken an empty shell of a building and transformed it into an inviting retreat. The POSH hair and makeup studio is lined with comfortable chairs for its customers and a makeup studio complete with right angle mirrors. I spent some time at this "pond" on Sunday. It was beautiful and peaceful. 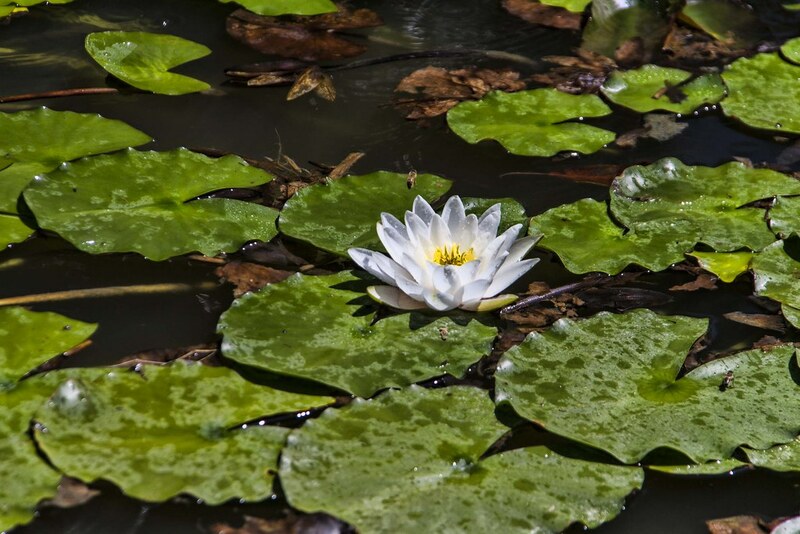 There were hundreds of dragonflies of different colors buzzing around the lily pads and bees making themselves at home. It was also dinnertime for the koi fish living here. Koi are such interesting-looking fish. According to Japanese legend, if a koi succeeded in climbing the falls at a point called Dragon Gate on the Yellow River, it would become transformed into a dragon. 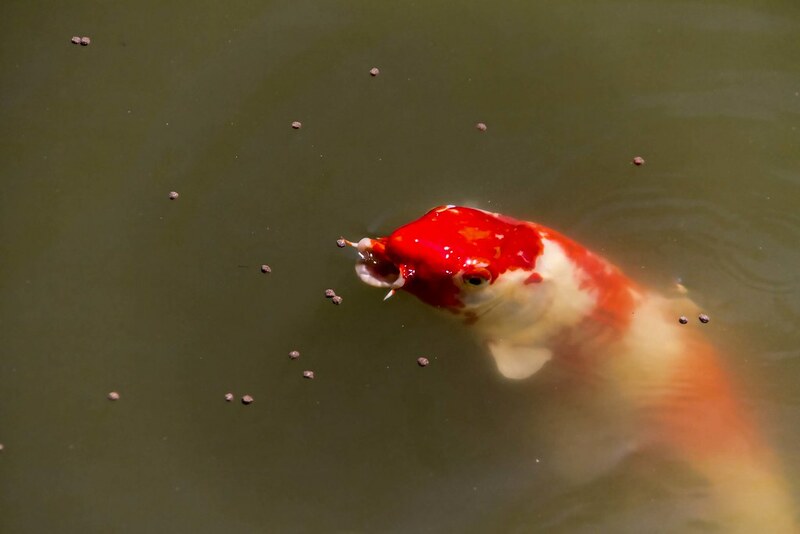 Based on that legend, the koi became a symbol of worldly aspiration and advancement. It reminded me of a koi experience we had years ago on vacation. 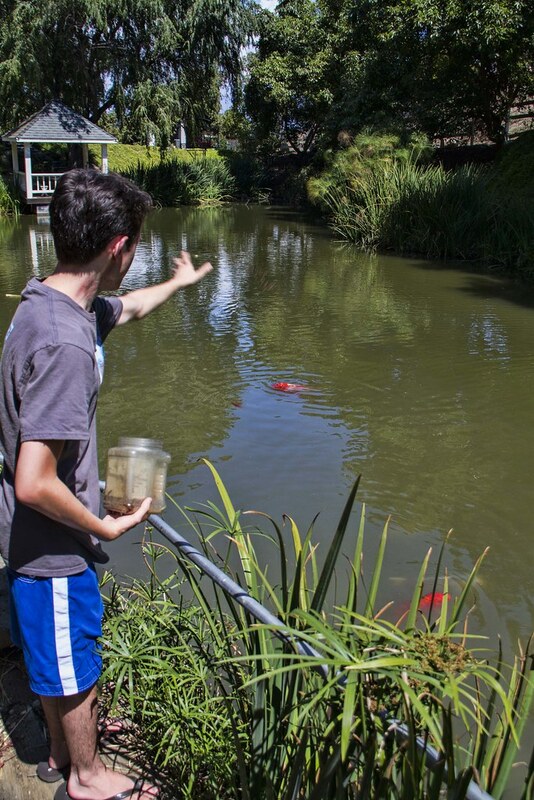 A koi was plucked out of a pond by a bird. The koi struggled so much the bird dropped him on the ground, right in front of my daughter. She didn't hesitate for a minute. She scooped up the koi and tossed him over a hedge that separated us from the pond. Hearing the splash of him landing in the water, we were sure he was some amazing fighting koi. 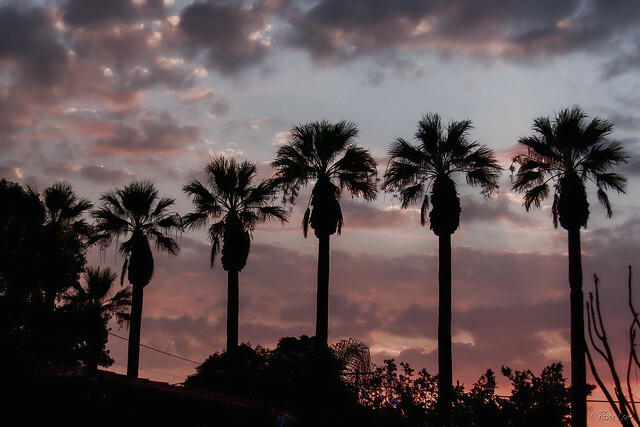 The palm trees that line Rives Avenue stand like sentinels watching the sun disappear over the Pacific. Not everything will fit into a trash can. When that happens, in Downey you have two choices. 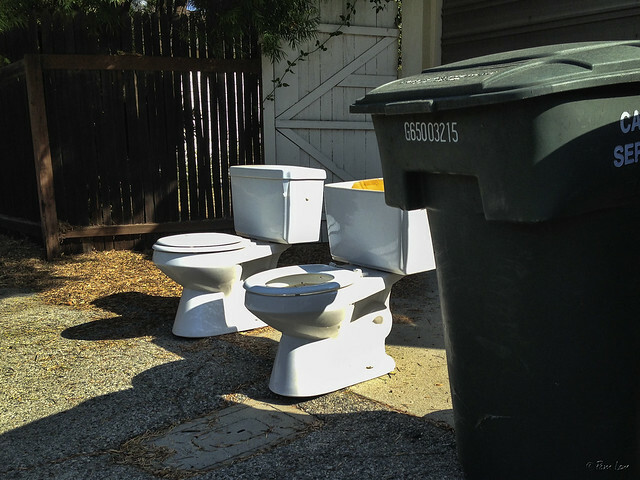 You can call the trash company and arrange for a large-item pickup. It's free, but it requires some advance planning and a phone call. Or, you can put your large item out in the alleyway. There are very few items that won't be picked up within a day by someone scrounging for a deal, thus proving the saying, "One man's trash is another man's treasure." My favorite time of day is when the sun is low in the sky. The colors are always so much stronger and I love how long shadows can be. 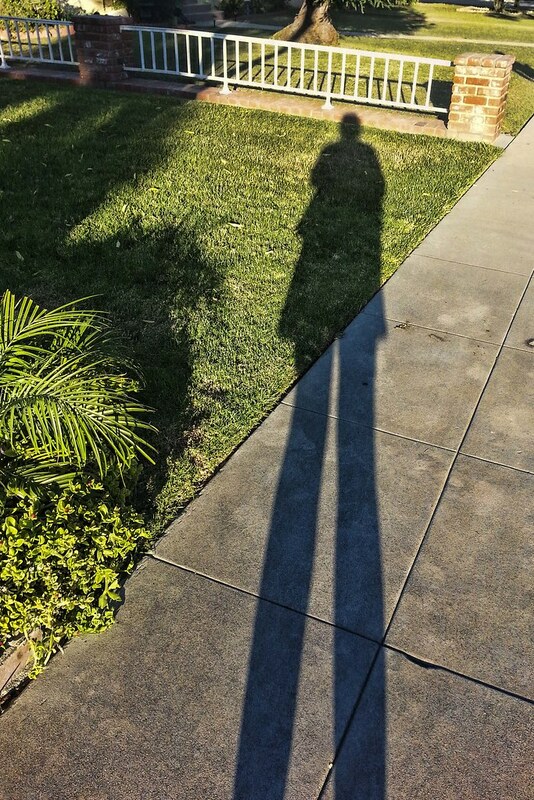 "Like our shadows, our wishes lengthen as our sun declines." The slogan of the Burger City Grill on every wall and picture is "Burgers Rule." And while I totally and completely agree, I couldn't help but be thoroughly impressed with their drink dispenser. Maybe I don't get out much, but I've never seen anything like it! All digital, you pick your drink of choice from a menu and then submenu and viola! A hundred different choices, right at your fingertips and one nozzle. I showed you yesterday a vacant building on Firestone that used to be used as an Arby's fast food restaurant. 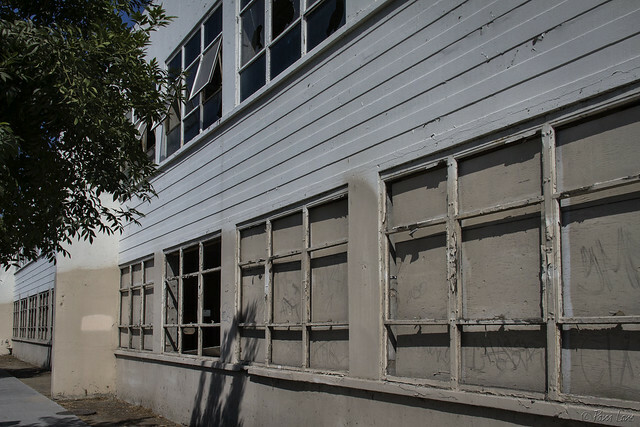 The thing about vacant buildings is that the owners usually do not have an incentive to keep up the property. Thus the "abandoned" look of the property. 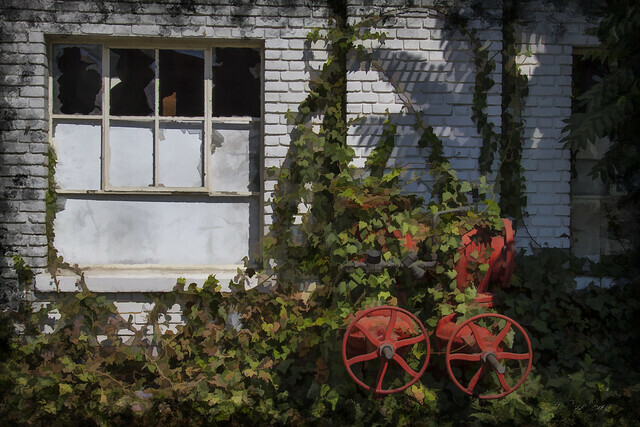 Because it does look abandoned, some people will take advantage of the situation and use the property for their own purposes without fear of being caught. Above I see a blanket in an alcove of the building, probably used for sleeping quarters during the night. It allows for some privacy and limited exposure to the elements. Others will use the property for a wide open trash can. The other day Pam showed you an abandoned building here in Downey so I thought I would show you another. It isn't that we are full of them but it is interesting how an abandoned building will take on a personality of its own. As you can see, this use to be an Arby's restaurant. They have taken care to board up all the windows and doors. They also removed the electrical boxes. It's a good location, being across from the Stonewood shopping center, so I'm sure it will be occupied soon. Tomorrow I'll show another use for an abandoned building. One of the things I like about Furman Park is all the activity going on. 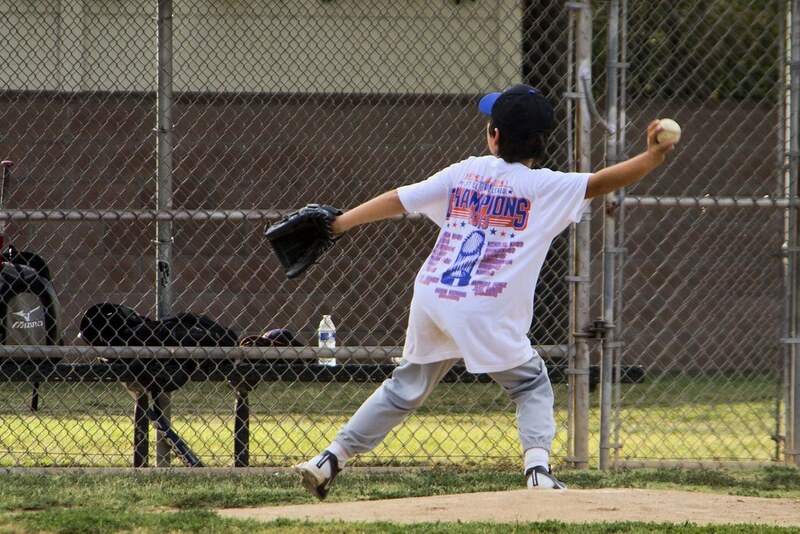 This day, I watched these young boys practice. They were working really hard, but they were also having fun. "No matter how good you are, you're going to lose one-third of your games. No matter how bad you are you're going to win one-third of your games. It's the other third that makes the difference." The "broken windows" theory holds that if a city doesn’t fix its broken windows and graffiti, the environment will continue to descend into crime, chaos and violence. So the appearance of a lot of broken windows recently was a little discouraging to me. 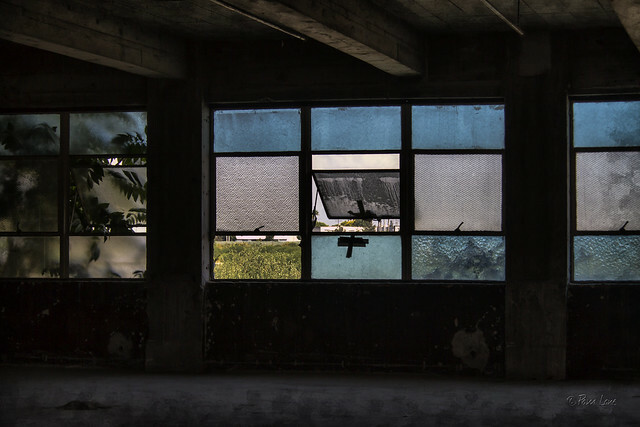 But in spite of that, urban decay like this holds a powerful draw to a photographer, with its opportunity to discover something of beauty in the midst of the decay. 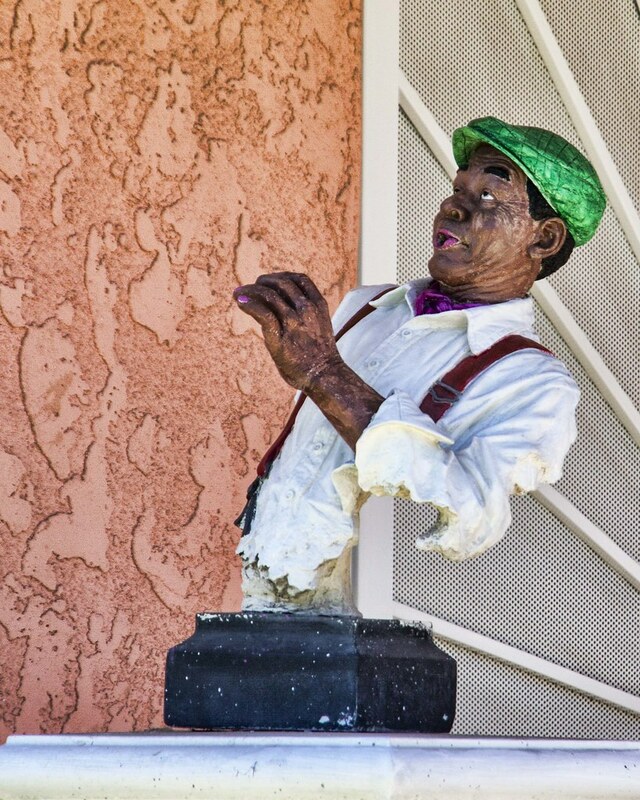 We've explored this idea before, in the old Rancho Los Amigos buildings (here and here). So, today, here's what drew me in. Tomorrow, I'll show you more of the decay, along with the location. It had been a long day at work. When I have those days, I often come home and spend some time outside in the yard, just puttering around to relax. 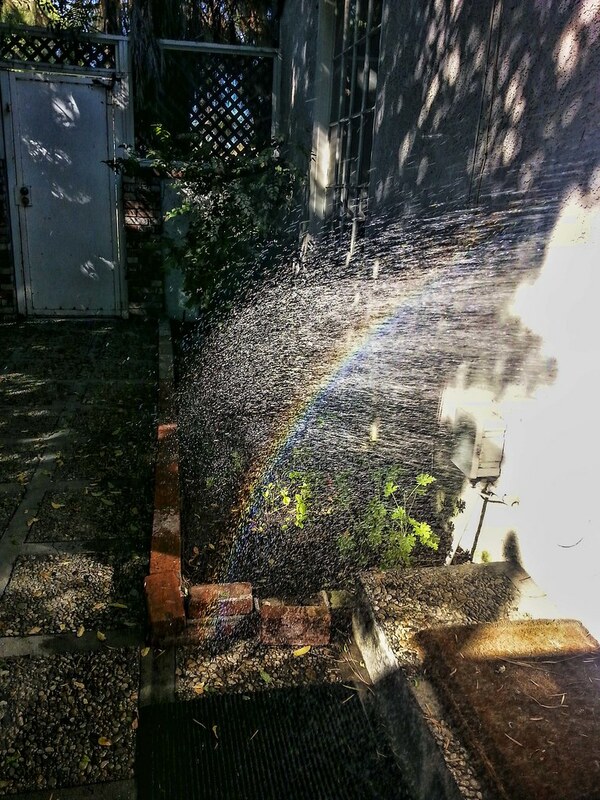 As I was watering some plants with the hose, I realized that the combination of the water and the angle of the sun caused this beautiful little rainbow for me. It was a fun blessing for my afternoon and a good reminder of the beauty that is often around us if we have the eyes to "see" it. "May the warm winds of heaven blow softly upon your house. I'm so jealous of the people who have the backyard gates leading right to the park. I only live a few blocks away, but if I were there, I could pretend the whole park was mine. Sitting on one of the benches today was so relaxing. It was nice in the shade and I didn't do anything for a while but watch the wind blow by. Went to Apollo Park this evening to see if I could see some softball games. Tonight was soccer practice though, so I went over to the indoor gym to see if I could see some basketball games, but it was girls' volleyball practice. Then I went out to the outdoor basketball courts to find some "pickup" games. I had a hard time getting a non-blurry shot but finally got the above shot. I also went over to the baseball diamond to find these people practicing ground balls. 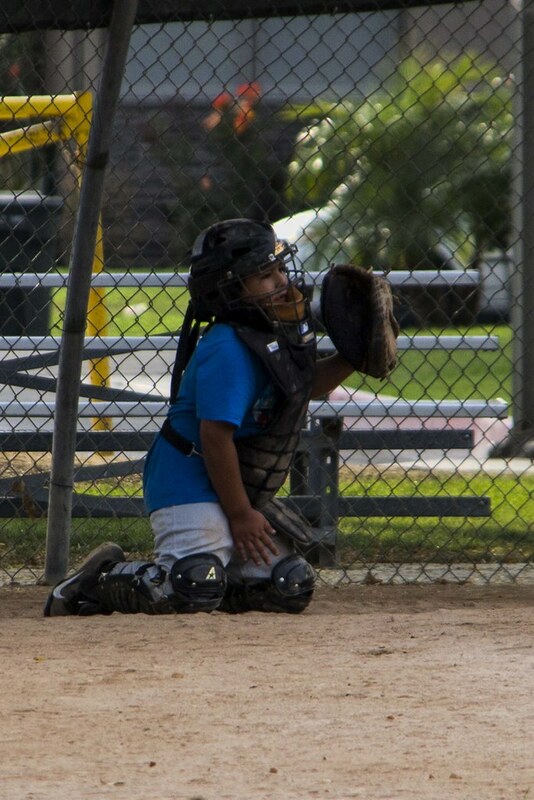 This is Alan Trejos, who is going to San Diego State to play baseball. I'm back from vacation in Cayucos, California, which I shared with you last week. As I said then, the city of Cayucos is just north of Moro Bay. You can see Moro Rock in the distance sticking out of the ocean. Moro Rock was spit out of a nearby volcano, about 10 miles away, to its present resting place just off shore. This beach spans the full length of the city of Cayucos and is several miles long. At low tide, it is one of the most peaceful ways to take a walk I know of. And even with an arthritic hip, I will walk a couple of miles and not take my mind off the beauty of the ocean. There are some places in this world that are that captivating. Of course, it helps to have a spectacular sunset and the love of your life beside you. Where do you like to get away? To be captivated? I passed this yard the other day and couldn't resist. 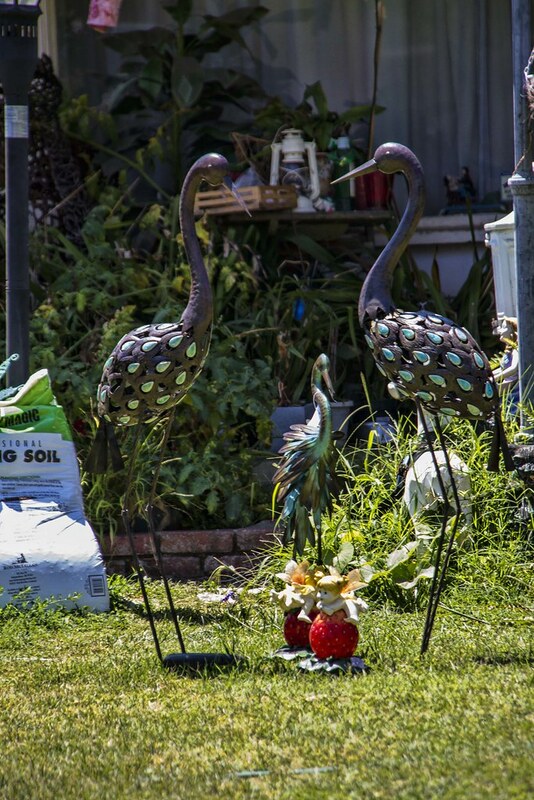 They had so many fun things in their yard. It is almost a garden in itself...all of the fun, random pieces that make up the whole design. A corner of grass and a few trees. That's all you need to make a park. Add a slide, a few swings, and a couple of benches from which to watch the kids play, and you have the perfect afternoon resting spot. 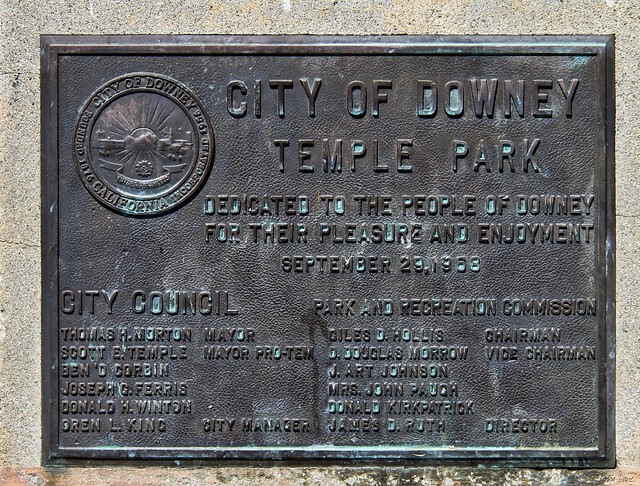 Temple Park is another of those Downey parks that are buried out of sight. Even though it's been around since 1968, I didn't even know it existed until this week. 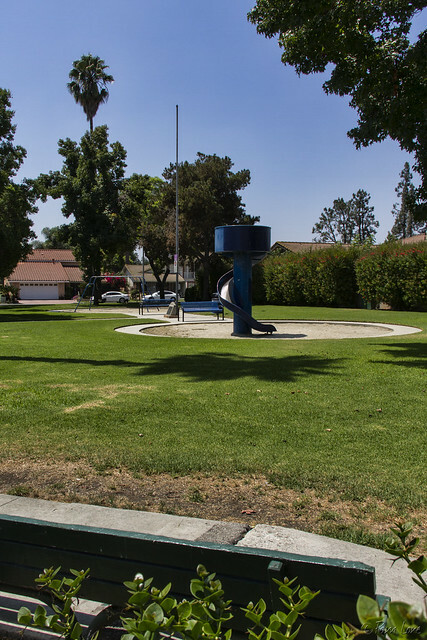 At .5 acres (or the equivalent of the two houses that it displaced), it is the smallest of Downey's parks. Several of the parks I've visited have a plaque commemorating the opening of the park. These plaques have served as a kind of time capsule of our city government. In this one, you'll see that, in 1968, Thomas H. Morton was mayor and Scott E. Temple was mayor pro-tem. I couldn't find any information on the naming of the park, but I think it's a good bet that the park was a pet project of Mr. Temple and was therefore named in his honor. 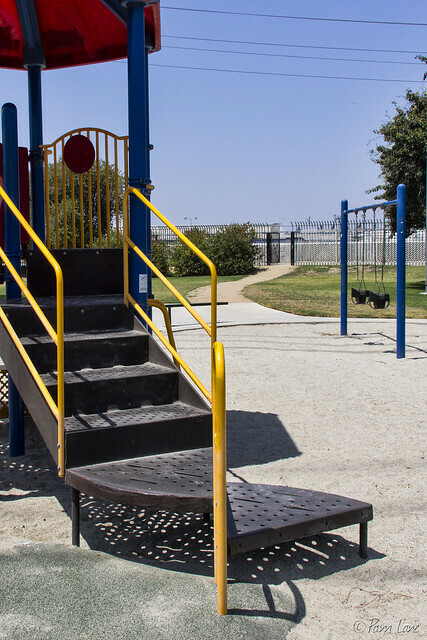 Some of Downey's Parks are so hidden away that most Downey residents will never know about them. One such park is Crawford Park. 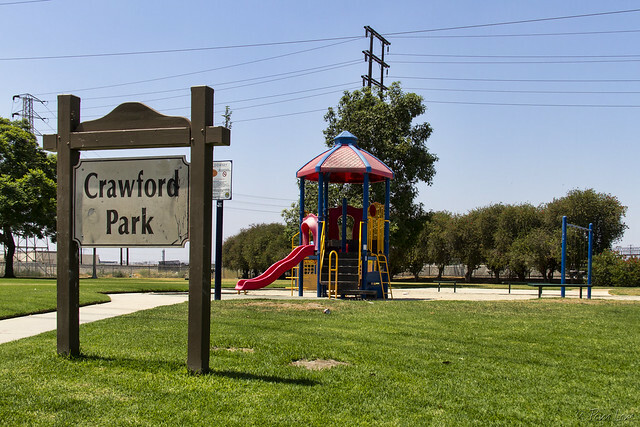 Crawford Park is located in a residential neighborhood that borders the Rio Hondo riverbed. Its main claim to fame, for me, is that it provides a place to park and easy access to the walking and bike trail along the riverbed. But it also has a small kids' play area, and a wide-open field that's great for an informal football or soccer game. I posted about these guys a couple of years ago. 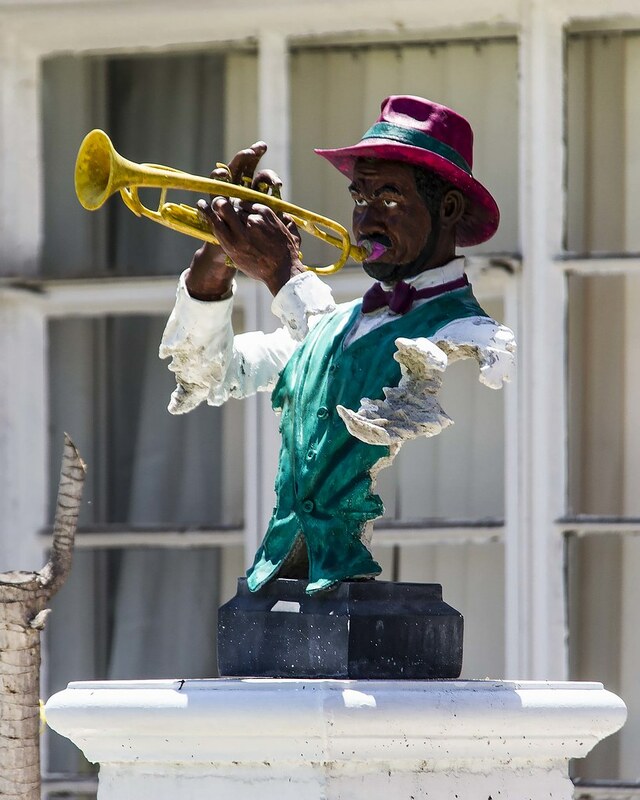 These are a set of busts set in front of a house. I think they're great. As I passed them the other day, I realized they had been repainted since I last posted. Tonight's concert at Furman Park featured the Downey Symphony Orchestra directed by Sharon Lavery, Music Director. We heard several John Williams movie scores including Harry Potter, Star Wars, and Raiders of the Lost Ark. There was a tribute to the military where they played the theme song for each branch and had those that were serving, had served, or had relatives that served in that branch to stand up when your theme song was played. I loved the young children that were brought and how they played by acting out the music. This is Ashley and Janette, who work with the Downey Civic Theater that hosts the Downey Symphony Orchestra during their performance season. 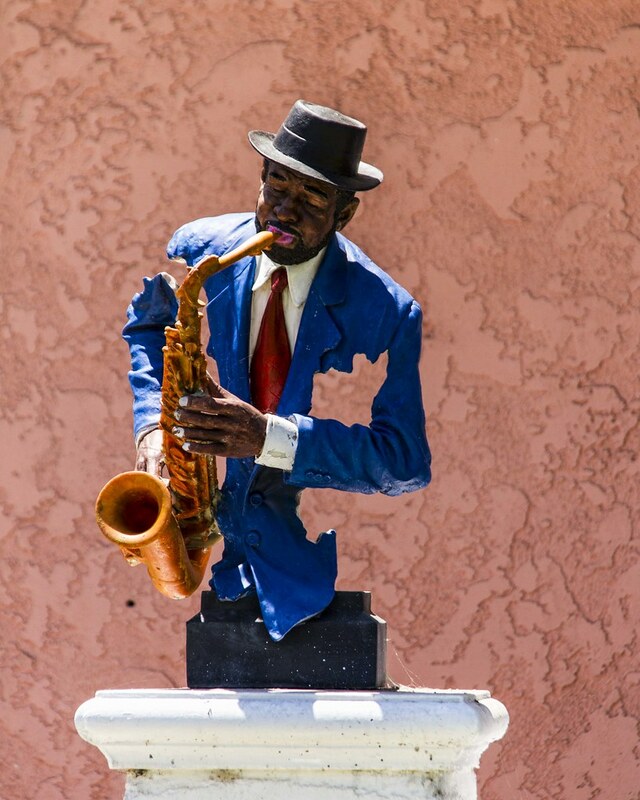 You can check out upcoming performances of the symphony here and the theater here. This baritone horn caught my eye because it has four valves, one is being pushed down, rather than the usual three. During the concert, some of the Downey Junior princesses go among the spectators and sell raffle tickets. I think it develops in them the confidence and composure to speak with others. Not everyone said yes. 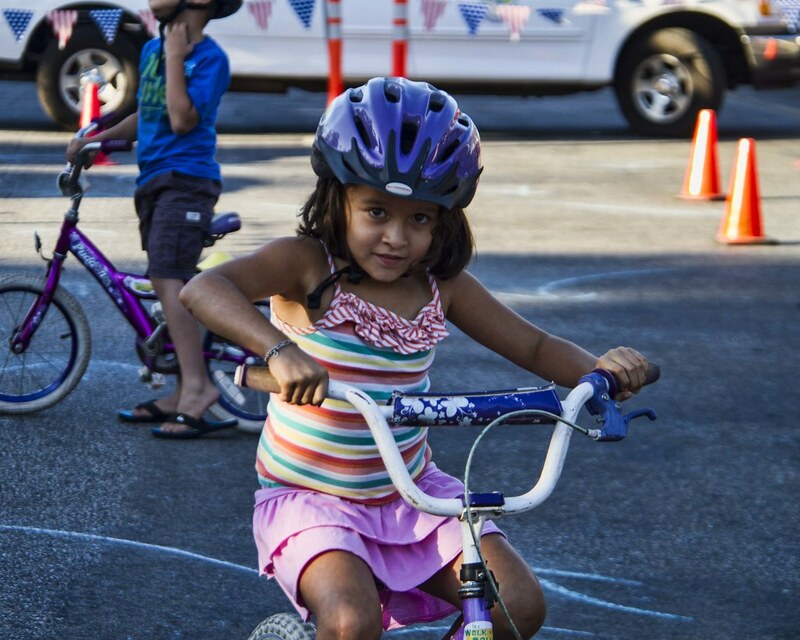 The first Tuesday in August has been recognized by communities around the country as National Night Out. 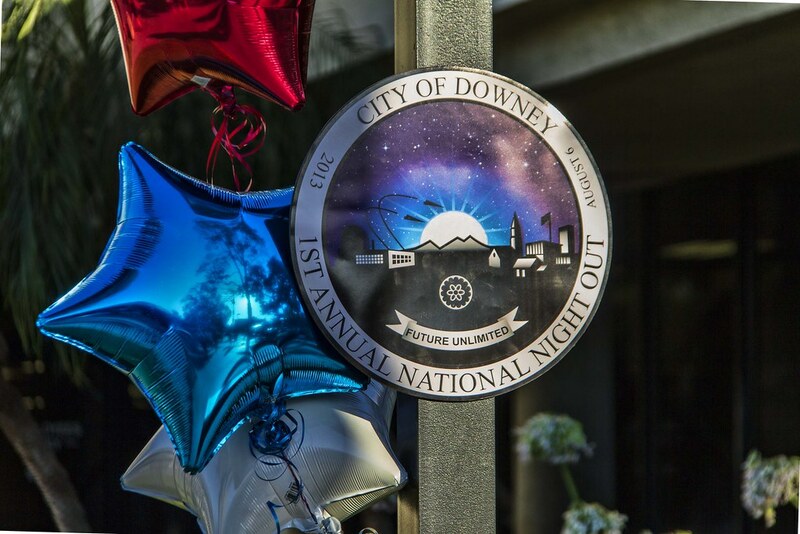 In the interests of increasing community spirit and enhancing crime prevention awareness, Downey had its own first annual National Night Out. Home Depot had a booth and was giving away free plants. (I picked up a habanero plant.) 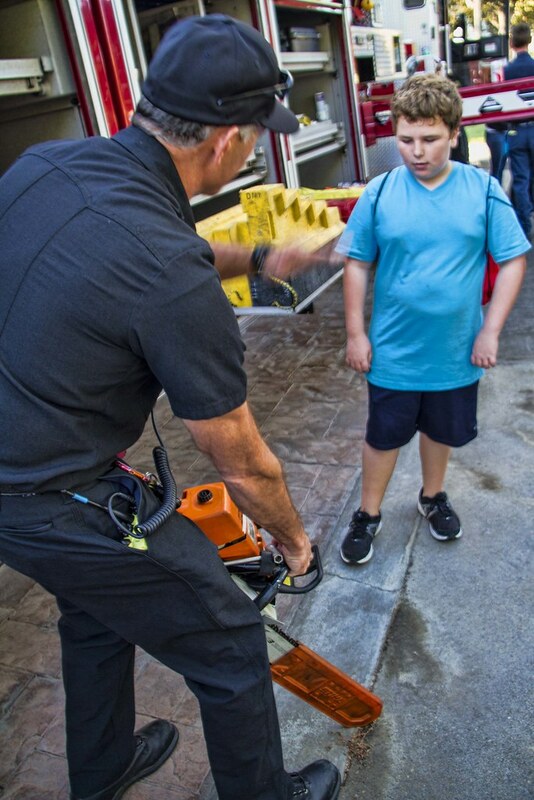 The fire station had all sorts of equipment out that they were demonstrating (mostly for the kids), and there were bike safety demonstrations. It was a pretty good turnout and everyone seemed to have a good time. Some day, Furman Park is going to have a new state-of-the-art walking path instead of a dirt path that sometimes turns muddy. 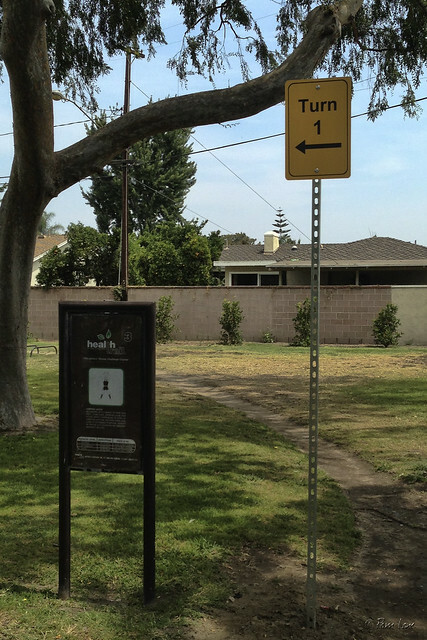 But for now, just in time for Walking Wednesdays with the Mayor, new signs along the Health Trail point the way to better health through regular exercise. 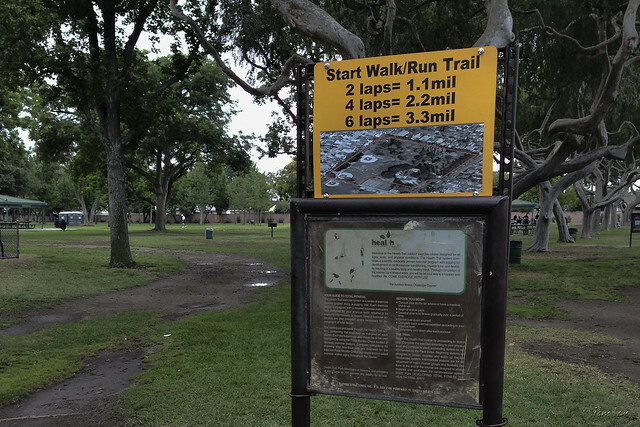 This first new sign (above), with its aerial view of the Health Trail, answers a question that has long been on my mind. It turns out that it takes two trips around the park to walk a mile (or 1.1 miles to be precise). At right, the yellow sign (along with several others at key points) answers a question that I don't think I've ever asked—do I need to turn here to stay on the path? I guess it's a helpful sign to those who are new to the park.